Since the fast-food mentality has been adopted by grocery food chains, we have become deluged with greenhouse-grown produce that bears little resemblance to real vegetables and fruits except for their appearance. The texture and taste of a supermarket tomato are just not the same as a home-grown tomato or one that is sourced organically. The same applies to all our vegetables and fruits that we can grow locally. It makes sense, then, that we endeavour as much as possible to take steps to bring about another green revolution, an organic one, in our own backyards. This is one of the best ways to empower ourselves in this age of convenience where products and services are readily available, but at a very high price. The price we pay is the health and well-being of ourselves and our children, and the time has come to stop and take back this important responsibility. Since we are what we eat, eating and growing organic will produce a better digestion for all and therefore good overall health, including sound sleep patterns, an enhanced immune system and a stable mental and emotional outlook on life. This brings peace of mind. Know your list of healthy food to always eat organic, and what produce is relatively safe to eat non-organic. Organic gardening for beginners can seem an overwhelming task, with so much to learn and do. 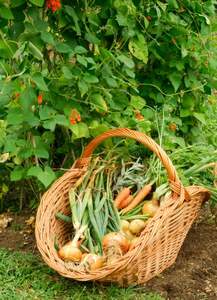 You can build up your organic vegetable garden over several seasons.